Whats to Love: The creative team behind the award-nominated Memetic is back with another apocalyptic tale! We obviously love working with James Tynion IV (see The Woods, UFOlogy, and the aforementioned Memetic), and we know partnering him once again with artist Eryk Donovan will lead to another great-looking story. In Cognetic, Tynion and Donovan offer a look at the fundamentally human desire for control-that deep-seated belief we all feel in our darkest moments that if we had total, absolute power, we would be able to create a perfect world. What It Is: Every human believes that they are self-reliant, self-determined individuals, each set on their own course. Theyve built civilizations, theyve built culture, theyve built lives... But what if that isnt the right track? What if there is a singular mind ready to take back control and finally right the destiny of mankind and build a better tomorrow? 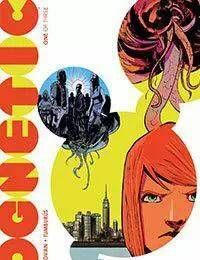 Cognetic is the story of a powerful psychic being that once controlled one-third of the worlds population as a part of its hivemind, and his return to humanity in modern-day New York City. Its a psychic action thriller, precariously positioned on the edge of outright apocalypse. Its also the story of the young woman, the assistant to the director of the FBI, who might be the only one who can save humanity, but at a terrible, terrible cost. The second entry in Tynion and Donovans Apocalypse Trilogy. Each issue in this miniseries is oversized with 48 pages!